Most of these are self-explanatory, but we ask that you please keep them in mind when you come into the shop. Due to space and safety precautions, we do not allow children of any age in the shop. All shops have bio hazardous materials. Although we keep it contained, we do not want to take the chance of a child coming in contact with these materials. Children are a distraction not only to their parents, but also to our other clients, staff, and artists. The shop is not a playground or a daycare. 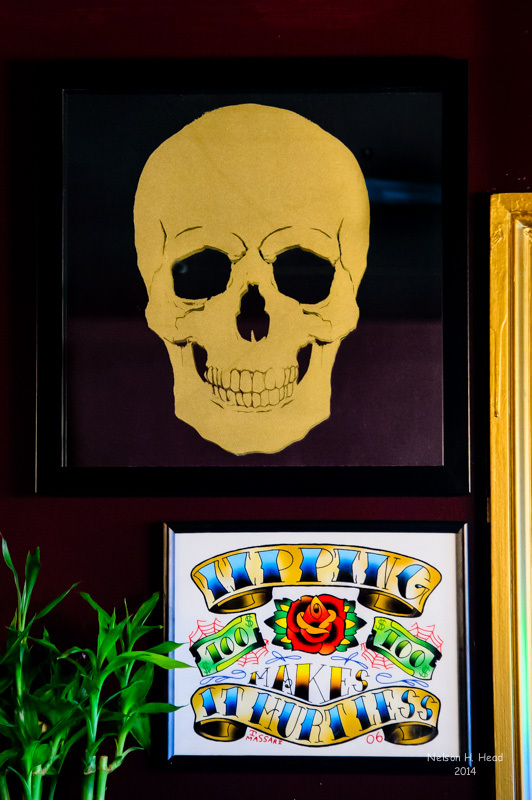 We try to keep the shop as professional as possible, but remember it is a tattoo shop and the music and conversations may not be appropriate for children. We understand that clients sometimes need moral support, however a group of people who aren’t getting anything done is very distracting to our staff and artists. Many shops don’t allow clients to be accompanied by any family or friends, but in our shop we ask that you limit your company to one person. You are buying art and the artists already know what their art will sell for. Bottom line: you get what you pay for. Paul is known for being fair. Good tattoos aren’t cheap and cheap tattoos aren’t good. Enough said. You tip the people who park your car, bring your food and do your hair. We are providing a service for you. Tips are appropriate, appreciated and generally fall in the same percentages as a restaurant gratuity. Please dress the part. For example: if you are getting your foot tattooed, wearing Uggs or heels is not appropriate. If you are getting your thigh tattooed, shorts are your best bet. Also, please do not wear your favorite article of clothing. We try to be as neat as possible, but your clothing could be stained by the ink. Please come to your appointment as you would to your doctor’s office. Bad hygiene is a distraction and can make other clients, our staff and the artists very uncomfortable. Cologne or perfume is also a distraction to the artist and some artists are allergic to artificial fragrances and getting tattooed by an artist with a headache will not yield the best results. Clients who come into the shop intoxicated will be refused immediately. We do not tattoo anyone who is under the influence of alcohol or drugs. No exceptions. If you come into the shop and are under the influence of alcohol or drugs, you will be asked to leave. Loud and obnoxious behavior is a distraction. Our artists are focused on giving all of our clients the best experience and tattoos as possible. Please be considerate to everyone in the shop. YOUR COOPERATION, BUSINESS, AND LOYALTY IS GREATLY APPRECIATED! Please visit our page on preparing for your tattoo – and if you have any questions feel free to contact us!